There’s nothing more Chinese than socialising over food and China has one of the richest and most diverse culinary traditions on earth. And Shanghai, as a Chinese melting pot, offers the best food from around the world. The history of foreign influence here and an increasing expat population has led to an abundance of international cuisines – from German brauhauses to Indian buffets – at all price levels. Eating out in Shanghai is much cheaper than in other international cities such as Tokyo or London, but if you prefer to cook at home, there are plenty of shopping options. The French chain Carrefour has stores in every neighbourhood for western groceries, but it’s worth learning the ropes at local wet markets, where fresh cuts and locally grown fruit and vegetables are a bargain by any measure. Shanghai dining can be divided into two peacefully coexisting camps: Chinese local food and foreign food in Shanghai. 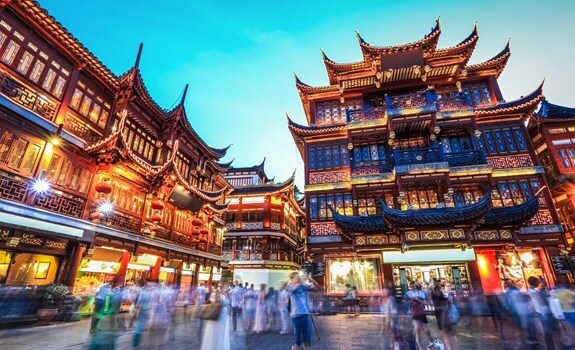 If you’re moving here long-term, you’ll have the opportunity to experience professionally prepared cuisine from all over China and the world. Though it may be easy to fall into a routine with your favorite restaurants or food from home (Shanghai is sure to have it), try to branch out whenever possible. In the end, you probably won’t have a choice, as Chinese business and social events take place over meals. Remember not to offer to pay if a local invites you out, just be sure to return the favour at a later date. It’s also customary to leave a bit of food at the end of the meal – finishing everything is a sign that the host didn’t order enough food. Tipping is not expected at low- and mid-range restaurants. Service varies tremendously. Don’t expect to be checked on frequently, especially when you’re ready to pay. Smoking is still allowed in many small restaurants, although it is perfectly acceptable to ask politely for patrons to stop smoking if there are non-smoking signs. Street-side eateries certainly do not comply with Chinese government standards of hygiene; however it doesn't hurt to go local from time to time. You’re generally safe at any mid-range or high-end restaurant when it comes to hygiene. Having food delivered is de rigueur in Shanghai, whether it is food from your favourite Western restaurant or the local noodle shop. Get to know the staff at your favourite local noodle and dumpling joints, ask them “keyi wai mai ma?” (do you deliver?) and chances are they’ll be happy to bring a meal to your door for no extra charge, or at most a nominal fee. Most pizza places deliver until late in the evening. For restaurant delivery, Sherpa’s (www.sherpa.com.cn) is a bilingual city-wide delivery service and is incredibly popular among expats. They deliver food to your door from over 100 Chinese and international restaurants.